Do carpet stains in your Springs Apartments home send you into a tizzy? There are options other than paying for an expensive professional cleaning or simply living with the marks. Many regular household items make terrific DIY stain removers. 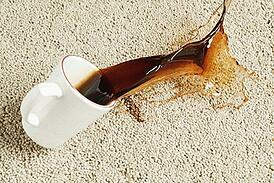 Here are solutions for some of the more common stains that are inflicted on carpeting. You may be surprised at how well these "miracle" cleaners perform. Pour some beer onto the stain and rub gently with a clean cloth. You may need to repeat this method once or twice to get the spot out completely. Spray with a mixture of vinegar, water and a non-bleach detergent, rinse with clear water, and repeat as needed. Pour a generous amount of club soda over the stain and blot dry. Fill a spray bottle with cold water and add two teaspoons of Dawn or another grease-fighting dish detergent. Apply until the stain is saturated, then blot with a paper towel or clean cloth. Rinse thoroughly with cold water. Make a paste with equal parts cold water and meat tenderizer. Apply to the stain and allow it to sit for 30 minutes before sponging off with clear, cold water. Moisten a clean cloth with isopropyl alcohol and use it to dab the stain carefully. Avoid rubbing or scrubbing that can cause the ink to spread. Let it stand for a bit, then rinse with water and blot dry. Hair spray, nail polish remover and other products with a high alcohol content work as well. Spray the stain with WD-40. Let it sit for a moment, then carefully clean the area with a sponge and warm, soapy water. For vomit or urine stains, wipe up as much as you can first before pouring baking soda over the area. Pat with a paper towel and let it dry completely before vacuuming. Baking soda deodorizes and sanitizes in addition to cleaning. Remove pet stains by spraying them with a mixture of one quart of warm water and either vinegar or a stain-fighting detergent. Let the mixture stand for a few minutes before blotting clean with warm water. Work some shaving cream into the spot and rub it off with a soft, damp cloth once it has dried. Sprinkle liberal amounts of cornstarch over the spots. Let it sit for several hours before vacuuming up the residue. Keep this list handy for future reference. Do you have any creative go-to methods of cleaning carpet stains? Share them with us in the comments!